Ales Loprais, Ferran Marco Alcayna and Petr Pokora again improved their overall ranking in the truck category after the Friday stage of the Dakar Rally 2019. The actors of the rally are over the demanding first week of the race, ended with two marathon stages, between which the crews had to do without assistance of their accompanying teams. On Saturday 12 January the race schedule includes a free day in Arequipa. The stage from Tacna to Arequipa, or its speed test section, with its 517 kilometres, was to be the longest for trucks and cars this year at Dakar. The leading group of trucks, including the crew of Tatra Jamal – Queen 69 with starting number 507, covered the whole distance, but after them the organizers stopped the race at checkpoint 3 at km 425. The reason was thick fog and worries about safety of the competitors. Because of that we will have to wait for the official standings for a couple more hours, for the organizers have so far only published the results from the stage finish. However, the overall results should not include the time between km 425 and 507, not covered by all teams. The crew of the Instaforex Loprais Team ranked ninth overall before stage five and they will certainly improve this ranking at least by three ranks. Two rivals, ranking before our team, got into serious problems and gained a considerable loss, and another was excluded from the rally completely. On the basis of simple addition of the achieved times the Czech-Spanish triad should rank sixth overall. 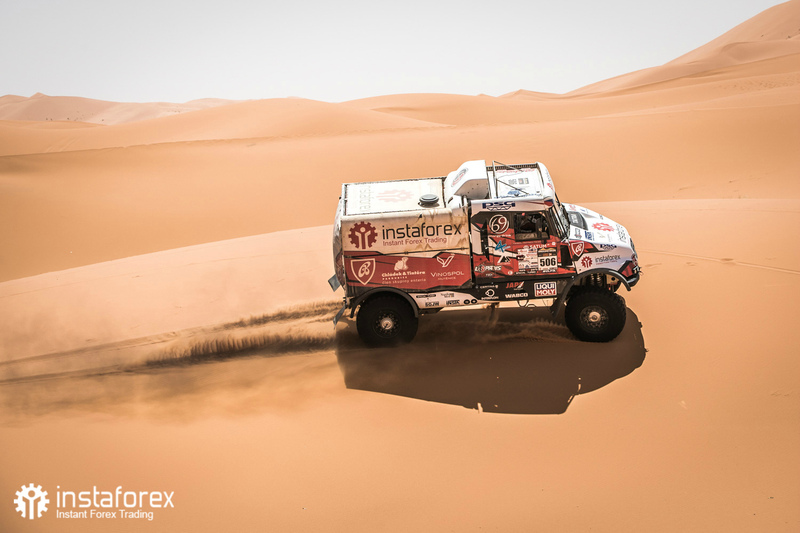 Before stage five Loprais was 45 minutes and 58 seconds behind Russian pilot Ayrat Mardeev and before the decisive CP3 Ales reduced the Kamaz pilot´s advantage by 43 minutes and 2 seconds. At the same time the Czech team tries to negotiated deduction of the time lost by helping a rival who had an accident. If the organizers meet this requirement the “Queen” should move up to the fifth overall rank. The first week dealt the cards, tired people and machines, but only the second half will decide about the final results. The competing trucks will have to cover another more than 1,400 kilometres of special sections in the following five days, let alone another huge portion of kilometres of the liaison sections. That is why the mechanics of all teams are very busy in the Arequipa bivouac now over the free day. “The race is quicker as well as more difficult day by day, but we keep advancing in the ranking. Every day is like on a swing. And many new experiences add together all the time. But all drive at the brink of destruction. I am not sure whether the trucks can endure that. Our truck is bound to endure. Our Queen will receive all love and maximum care for a day and a half. She will receive all new parts we have on us here,” promises the 39-year-old pilot.